charmcityartsmaven: McFF YEAR-ROUND PROGRAMMING @ THE PARKWAY THEATRE BEGINS MAY 12! McFF YEAR-ROUND PROGRAMMING @ THE PARKWAY THEATRE BEGINS MAY 12! We can think of no better film to kick off our year-round Parkway programming than this classic from Baltimore’s own Pope of Trash, John Waters. Arguably John Waters’ masterpiece, Female Trouble offers the best of both worlds—the brilliantly nasty dialogue and transgressive content of his underground films colliding with the assured direction of his later work—even as it brims with some of the most outrageous characters from any era. Divine stars as teen runaway Dawn Davenport, alongside fellow Dreamlanders David Lochary, Mary Vivian Pearce, Edith Massey, and Mink Stole. *Special guest host for Friday May 12! Author Chris Holmlund will present the Friday screening and participate in a Q&A about the film. Her book, Female Trouble: A Queer Film Classic is the first title in Arsenal Pulp's Queer Film Classic series to focus on the work of legendary director and cinematic camp icon John Waters. Holmlund's book examines John Waters' 1974 dark comedy's camp aesthetic and its position in the history of independent film. Chris Holmlund will also be discussing her book at Atomic Books on May 13, 7-9pm. AUTHOR BIO: Chris Holmlund is Arts and Sciences Excellence Professor in Film and French at the University of Tennessee-Knoxville. Her previous books include Contemporary American Independent Film, co-edited with Justin Wyatt (Routledge, 2005) and Between the Sheets, In the Streets: Queer, Lesbian, Gay Documentary, co-edited with Cynthia Fuchs (University of Minnesota Press, 1997). To celebrate one of our greatest living filmmakers and whet your appetite for the coming new episodes of Twin Peaks, here are two of David Lynch’s essential works that we feel pair particularly well with the historic Parkway auditorium. 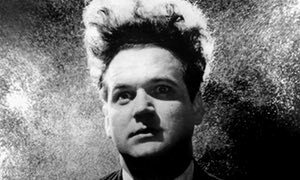 Several years in the making, Eraserhead put David Lynch on the map, and stands as a landmark film in surrealism, body horror, and midnight movies. In this L.A.-set neo-noir, Naomi Watts stars as both wide-eyed aspiring actress Betty Elms and the depressed and desperate Diane Selwyn—who may or may not be two iterations of the same person. Heralded as the first great film of the 21st century, to many it still stands as the single best. And more!!! Opening Week at the Parkway also hosts an Emerging Films series and Radical Films of the 60s and 70s. Visit our website for full details on screenings. Download the Opening Week programming PDF here. We will be bringing you weekly Wednesday Behind the Screens updates to your inbox with the Parkway's films and schedule. Be sure to check your email and follow us on social media for the latest updates!